Odd to be blogging about the spring game on a day when meteorologists expected a couple inches of snow which turned into 10. But such is life in the Great Lakes State. But believe it or not, the spring game is less than a couple long short months away. 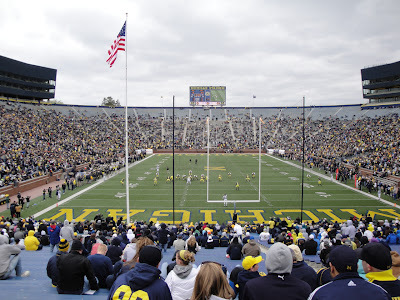 ANN ARBOR – The University of Michigan football team will hold its annual spring football game on Saturday, April 16, at noon EST at Michigan Stadium. The Mott Spring Game is the second in a three-year partnership between the athletic department and C.S. Mott Children’s Hospital to help promote the opening of the state-of-the-art women’s and children’s hospital at the University. Michigan had two of its largest spring game attendances the past two seasons, netting nearly 35,000 last year and an estimated record-crowd of 50,000 fans at the 2009 spring game. This year’s game will be broadcast live by the Big Ten Network. An estimated 35,000 fans showed up for the 2010 spring game. A couple interesting notes. Firstly, the game will air live on BTN at noon. Correct me if I'm wrong, but this is the first time I can remember a Michigan spring game airing live on TV. Secondly, we're adding the "Mott" to the title of the event. I can't remember the spring game ever being branded before. Of course this is for a good cause, and not just a corporate sponsor. But I have to wonder if an admission charge is in our future. The prospect of 50,000 fans showing up has to create some sort of conversation on some level about a way to cash in. Schools like tOSU charge an admission fee and often average close to capacity numbers. I'm all for a $5 or $10 ticket price just as long as the money goes to somewhere like the Mott and doesn't just get filtered back into the athletic department. AND...the tickets should just be sold on a first-come first-serve basis and are not offered to season ticket holders first and general public second. Just charge $5 at the door, and let people sit where they want. That's part of the beauty of the spring game. It is and should always be an informal event as far as the crowd is concerned. It's a great event to bring young kids to who might not normally get a chance to see the Big House for a game in the fall. I hope it stays that way.